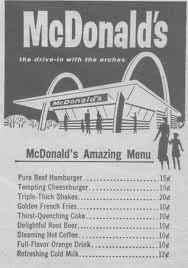 Check out McDonald's original prices. Here are a few food-related-events occuring over a past 50 year period. 1950’s – USDA creates four basic food groups: milk, meat, fruits and vegetables, and breads and cereals. 1954 – Swanson unveils the first TV dinners. 1955 – Ray Kroc opens his first McDonald’s franchise. 1963 – Weight Watchers is incorporated and the first public meeting is held in a loft in Queens. 1967 – Amana introduces the first domestic Radarange microwave oven. 1977 – Portion sizes start to swell. Hamburgers expand by 23% in the next 20 years; a plate of Mexican food gets 27% bigger; soft drinks increase by 52%; snacks (potato chips, pretzels, crackers) grow 60%. 1989 – February is declared National Snack Food Month by the Snack Food Association. A month-long campaign results in a 41% increase in snack food consumption. 1990s – Foods labeled “Low-Fat” and “Lite” hit their stride. 1991 – The World Wide Web is born. 1992 – USDA Food Pyramid is created. 1998 – Olestra, a non-digestible, nutritionless fat substitute is approved by the FDA for use in no-fat snacks. 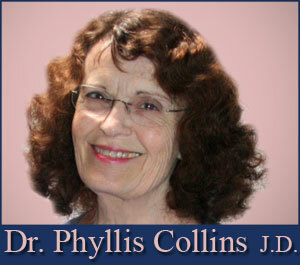 Hi Phyllis, Thank you for that. Kind of makes you wonder what the next 50 years will bring. Will we be all drinking green bubble-up and rainbow stew?What I would like to see. 2013 - Obesity conquered and a thing of the past after abolition of the Snack Food Association. Hi John. 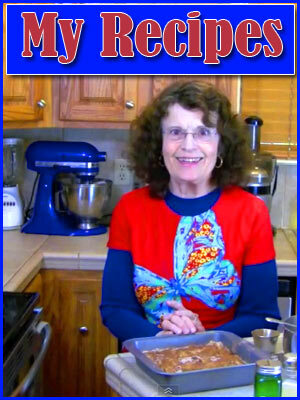 I think that looking at a food timeline is especially interesting for those of us who are over 60. I remember when I was kid that the only McDonald's in town looked like the one above. It also had a sign that said "over one million (billion? )hamburgers sold." I cannot recall the exact prices but I remember that I bought a burger, fries and coke, paid with a dollar and got change back. And I was skinny. Those were the days! Hi Jethro. I remember when my parents took me to the brand new McDonalds. The building was red and white stripes. My parents bought me a burger AND a fry AND a soda, which was quite unusual because my father was VERY frugal, and usually it was only a burger and MAYBE a soda too.